Fenton Friday: Green Beans on the Scene! 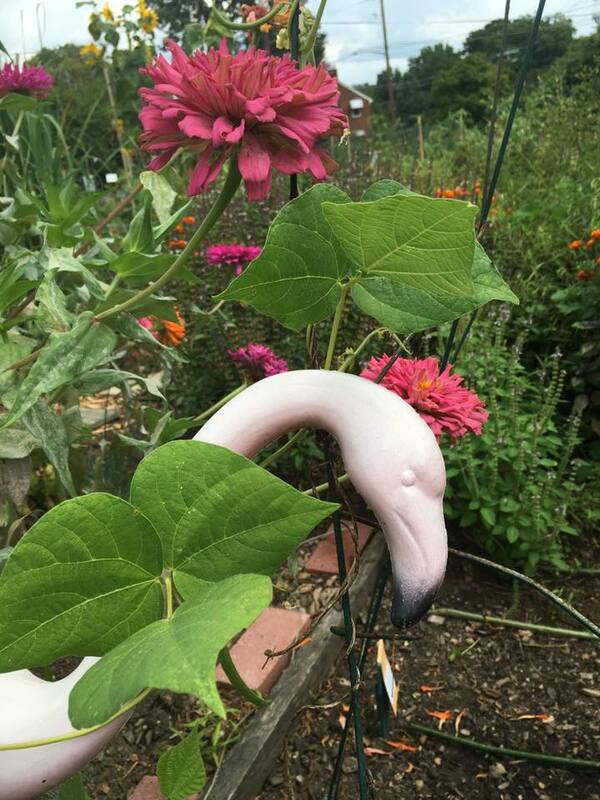 If you look REALLY close at the photo and the vine wrapped around my Yard Flamingo, you will see actually green beans forming! The rabbits are still a PITA in our community garden, but they I sprinkled used kitty litter (all organic) around my plot and it stinks a bit, but I looks like it worked to allow my green bean vines to grow back and I hope allow me at least one meal out of them. If you look beyond the vine, you'll see a seed pack marking a newly cleared section of the plot where new intern Ashley and I put in beet seeds this week. We are going to see if we can get them grown and harvested before a killing frost moves in. According to the seed packs, we should have beets in 50-60 days from germination, we shall see. What do you do when cherry tomatoes are ripening faster than you can eat them? Make this lovely salad for a potluck or picnic to share with friends! If you think the combination of tomatoes and watermelons sounds odd, just try it -- I promise you, you'll soon be addicted to this aromatic combination. For this recipe, the amounts are up to you. 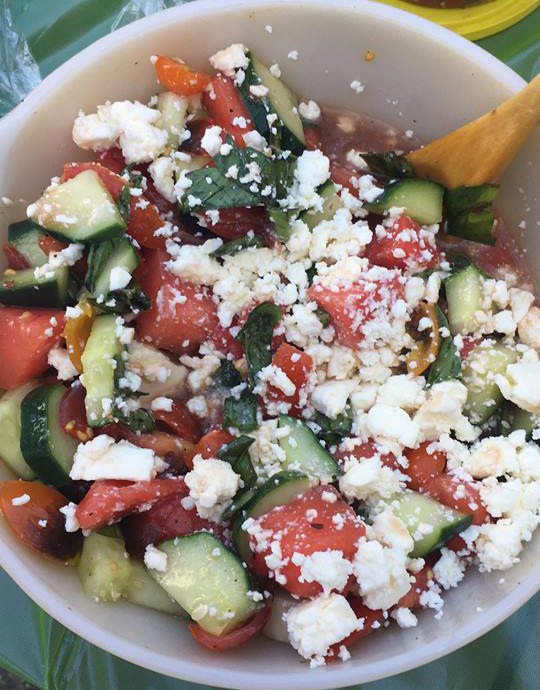 I tend to do one-cup watermelon and one-cup tomato and a 1/2 cup of the feta cheese fora single serving dish for myself, but you can adjust that however you like. Cut tomatoes and watermelon into bite-sized pieces and put in a pretty serving bowl. Tear up the herbs into small pieces and thrown that in the bowl too. Drizzle with Balsamic vinaigrette and toss everything together. Just before serving add in the Feta cheese crumbles and any other optional additions you desire. This salad is best eaten fresh, but leftovers can keep overnight. Serve with a crusty bread to sop up those good juices. *Balsamic vinaigrette can be store-bought or mix up your own with balsamic vinegar, olive oil, Dijon mustard, garlic, onions, and salt/pepper to taste. 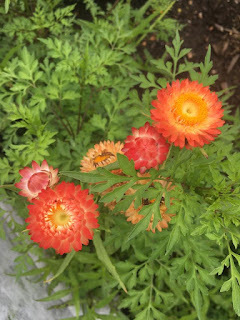 "Savory Sunday" is a blog series with seasonal recipes from the garden. We had almost 200 people come to last Saturday's Washington Gardener Magazine 11th Annual Tomato Taste at the FreshFarm Silver Spring Market today. Here are the results of the ballots submitted. Do take a minute to click on the photo link here to view the Facebook album of photos from the event. I think you will agree that the market tomatoes are absolutely gorgeous and very photogenic. 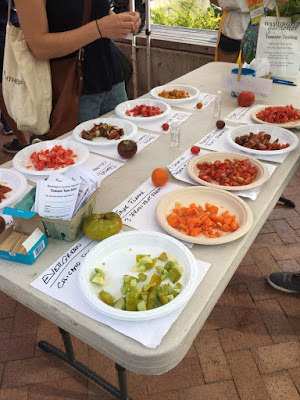 In addition to the tasting, many people stopped by to create colorful tomato art and to pick up the free tomato seeds, growing tips, and recipes that we gave out. 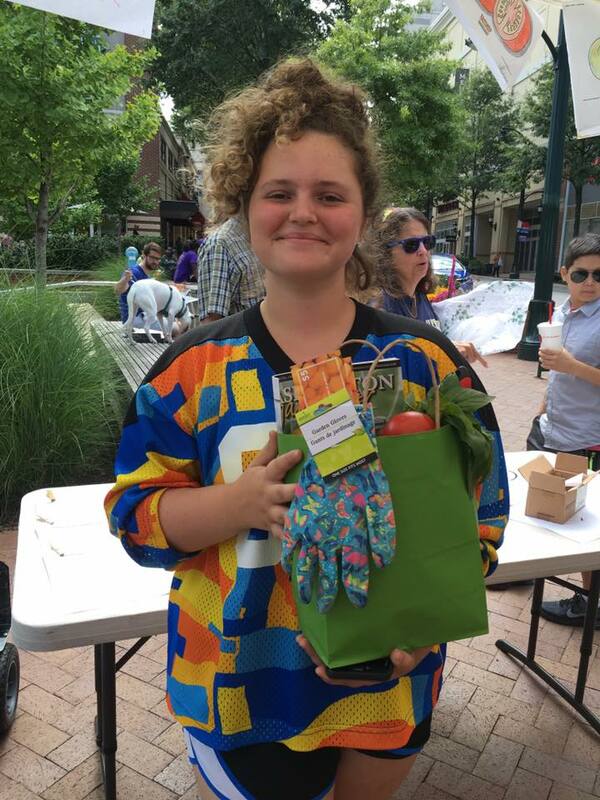 Kendall Wienecke of Washington, DC, (pictured here) won the prize drawing of a gift bag full of gardening tools, tomatoes, fresh mozzarella, basil, natural insect repellent, and market money! Most of the taste attendees were local, though we also had many who came quite a distance. About half live in Silver Spring. Another third live close by in Washington, DC or the neighboring towns of Takoma Park, Chevy Chase, and Wheaton. From farther away in Maryland, folks came from Rockville, Reisterstown, College Park, Columbia, Davidsonville, and Greenbelt. From out of the area, we even had a few votes from Pennsylvania and Massachusetts! Thank you to all who came and participated. Thanks to the farmers for growing great tomatoes and to FreshFarm Markets staff for hosting us. Special thanks also to our incoming Fall 2018 semester intern Ashley O'Connor for helping with all the tomato sample cutting and helping greet all the tasters in the short two-hour event! 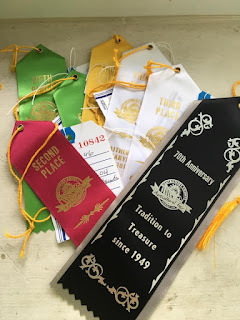 Last week I was in Chicago for the annual garden writers conference, one of my last errands before I jumped on my flight was to drop off my entries at the Montgomery County Fair. The entry choices from my garden were slim this year with all the rains and cooler weather. I didn't enter any vegetables. I did manage to scrounge up some cut flowers to submit and here are the ribbons they earned (4 were for roses!) -- along with a special 70th anniversary fair commemorative ribbon. Back home, I visited the garden plot and found a bounty of tomatoes had now finally ripened. How I would have loved to have entered those 'Midnight Snack' beauties into the competition. Ah well, there is always next year. This week I picked (pictured clockwise from top): 'Tasmanian Chocolate', 'Garden Gem', 'Midnight Snack', 'Super Sweet', 'Centiflor', and 'Sun Gold'. 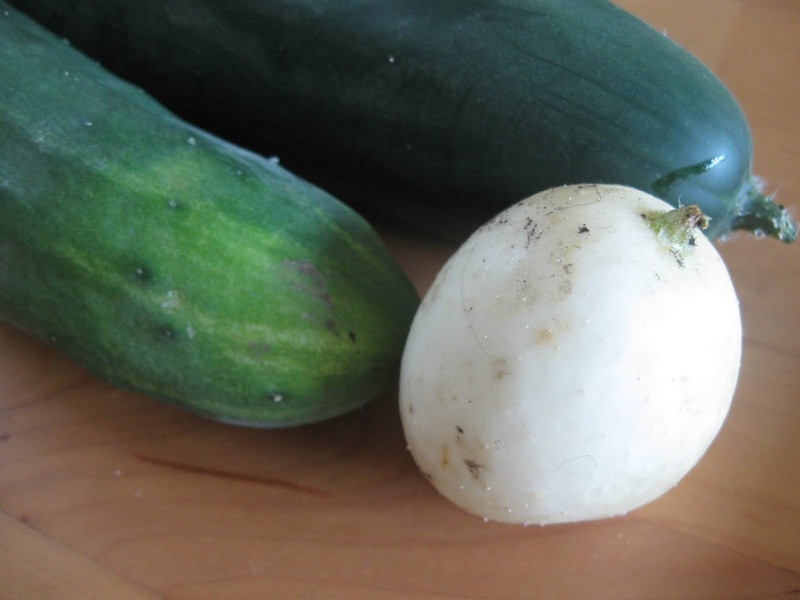 Pictured here are 'Marketmore' and a small 'Platinum' cuke. I haven't cut the latter open to taste yet, but I am guessing it is likely very mild. The 'Platinum' vine doesn't look like it will produce any more than this puny little guy. However, 'Marketmore' earns its name with several cukes this week and many more forming. For our August 2018 Washington Gardener Reader Contest, we are giving away a pair of passes to Tudor Place in the Georgetown neighborhood of Washington, DC. They include a guided house tour and self-guided garden tour. 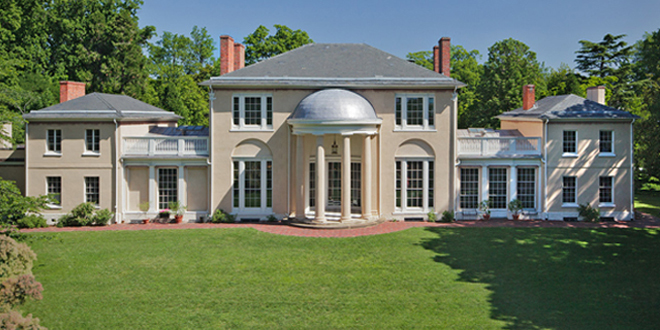 Unlike most historic houses, Tudor Place presents not one specific era or topic, but six generations of public and private life, indoors and out, from the agricultural era to the Cold War. On 5½ acres, Tudor Place remains one of America’s last intact urban estates from the Federal period. Its open lawns and garden rooms are a delight and a useful historical record of land use over time. Thomas and Martha Custis Peter put their land to agricultural and ornamental uses. Trees and shrubs they cultivated still grow on the site today. Email WashingtonGardener@rcn.com by 5:00pm on August 31 with “Tudor Place” in the subject line and in the body of the email. Include your full name and mailing address. Tell us which was your favorite article in the August 2018 Washington Gardener issue and why. The pass winners will be announced and notified on September 1. Our pass winner is Nancy Khan, Washington, DC! 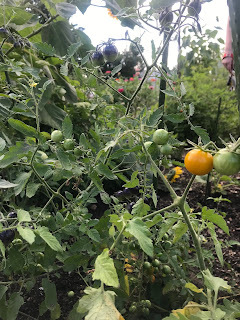 This summer I learned how to grow tomatoes. It was my first time growing anything edible. 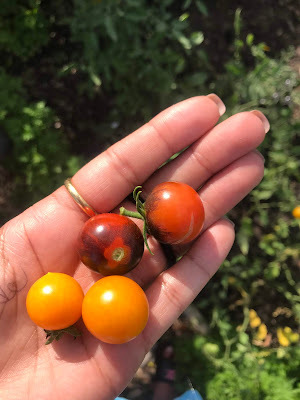 I grew them in the Fenton Street Community Garden in Silver Spring, MD. 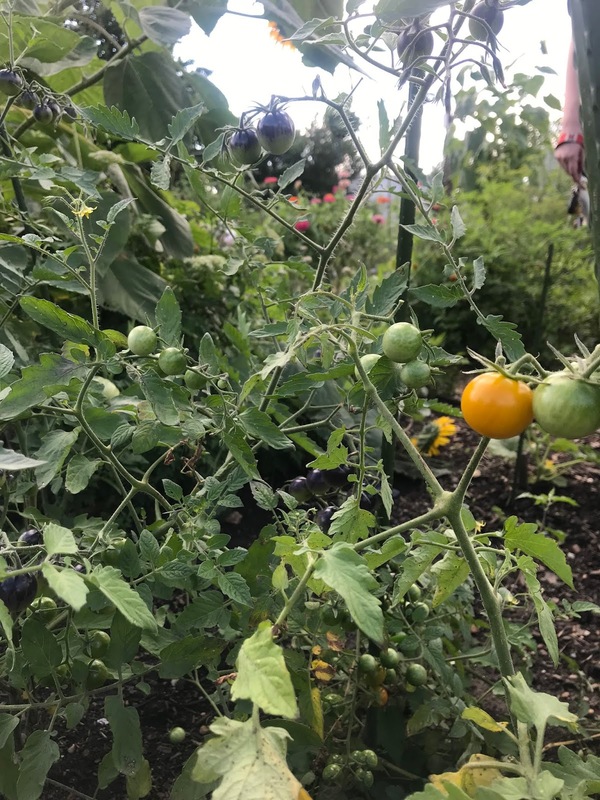 At the beginning of June, I planted 6 varieties: 'Tasmanian Chocolate', 'Midnight Snack', 'Super Sweet', 'Sun Gold', 'Centiflor', and 'Garden Gem'. I planted the seedlings deeper than soil level (buried 4-6 inches up their stem) and learned how to water them at the root and use planting clips and rods so that they don’t fall over. Every week, we weeded the garden and once we also used fish fertilizer to provide extra nutrients. I also learned the importance of taking off the dead yellow leaves, so that disease doesn’t spread up the plants. There was something so gratifying about getting down in the dirt, putting in work, and watching them grow over time. Baby tomatoes popped up quicker than I thought, but it took a few sunny weeks for them to ripen. When I tasted the first ripe tomato ('Garden Gem') I was so proud. I will never look at a single tomato the same! The 'Midnight Snack', 'Sun Gold', and 'Super Sweet' varieties are doing very well. 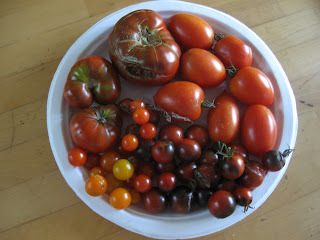 The 'Garden Gem' was fruitful, but a few started to rot with the heavy rainstorms we had throughout July. I am still waiting for the 'Tasmanian Chocolate' and 'Centiflor' to ripen. The 'Sun Gold' were my favorite. They were bright orange and super sweet. The 'Super Sweet' were a little darker and not as sweet as the 'Sun Gold'! The 'Midnight Snack' are darker purple-red cherry tomatoes and they were delicious as well. I have yet to try the 'Tasmanian Chocolate' and the 'Centiflor', but hopefully I’ll be able to in the next few weeks. Overall, it was a success! About the author: Racquel Royer is a senior studying broadcast journalism in the Philip Merrill College of Journalism at the University of Maryland, College Park. This summer, she is an editorial intern at Washington Gardener. Join us for a stress-free, creative break during the final weeks of summer. We'll gather at the Catylator Makerspace in the basement level of the World Building in downtown Silver Spring, MD. 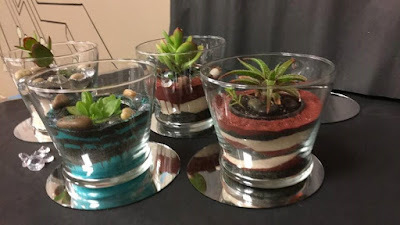 We will be making a glass terrarium with succulents and adding a touch of sparkle to it. All materials are included as well as care instructions to keep your succulent happy and thriving. The August 2018 issue of Washington Gardener Magazine is now out. Note that any submissions, event listings, and advertisements for the August 2018 issue are due by September 1. This summer I attempted to grow cucumbers in our community garden plot. After planting the seeds for three different varieties in early June, I was excited to see how they would turn out. The results were a bit lackluster, but I did end up with one average-sized cucumber. I was happy to walk away from my internship with one cucumber in hand—it tasted pretty good and had a fresh crispness! The three varieties I planted were 'Marketmore', 'Parisian', and 'Platinum'. The 'Marketmore' was the one that managed to make a decent cucumber before I left. In the first few weeks, the 'Marketmore' and 'Parisian' were growing steadily, but the 'Parisian' vines grew much more quickly. I had to replant the 'Platinum' seeds because the first set never came up. Although it had a delayed start, it began to grow nicely. 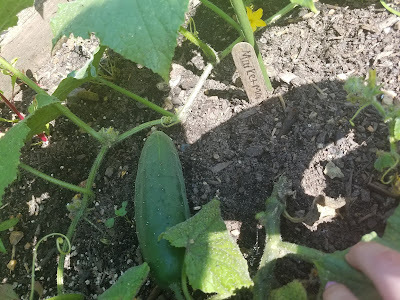 Towards mid-July, we saw a baby cucumber on the 'Parisian' plant, which made me hopeful. In the next few weeks though, the plant began to droop and the vines started to die-off. Sadly, the baby cucumber didn’t continue to grow and shriveled with the rest of the plant. This past week the 'Parisian' plant was completely dead. We pulled the plant from the plot, so hopefully whatever disease killed it doesn’t infect the other plants. The other two seem healthy and have lots of flowers (though the 'Marketmore' is much larger now), so hopefully they’ll produce a few more good cucumbers before summer ends. About the author: Rosie Kean is a senior multiplatform journalism and English major at the University of Maryland, College Park. She is from Macungie, PA. This summer, she is an editorial intern at Washington Gardener. Love tomatoes? This event is for YOU! It’s ‘Big Boy’ vs. ‘Mortgage Lifter,’ hybrid vs. heirloom, the tomato wars have just begun. Everyone is sure that their tomato pick is the tastiest. 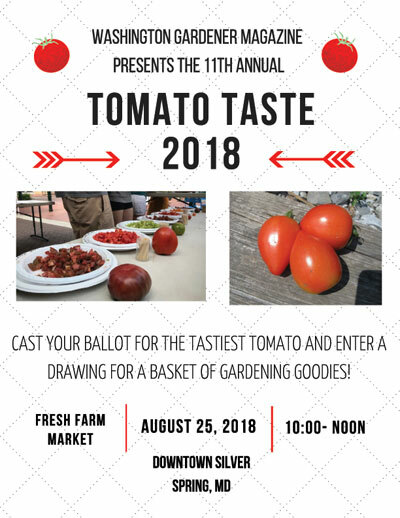 Join Washington Gardener Magazine at the FreshFarm Market in downtown Silver Spring, MD, on Saturday, August 25 from 10am-12noon for a Tomato Tasting. Best of all, this event is FREE! Farmers at the market will contribute their locally grown selections — from super-sweet ‘Sungold’ to not-so-pretty ‘Cherokee Purple’ — and we’ll explore which tomatoes make the short list of favorites. We’ll have tomato gardening tips, tomato recipes, tomato activities for kids, and much more. All to celebrate one of summer’s greatest indulgences — the juicy fresh tomato. Tip: Your tomato taste voting ballot is also your entry into our prize drawing for a basket full of gardening goodies. The drawing is at 12noon, so be sure to fully fill out your ballot by 11:45am and then stick around for the prize announcement as you must be present to win. 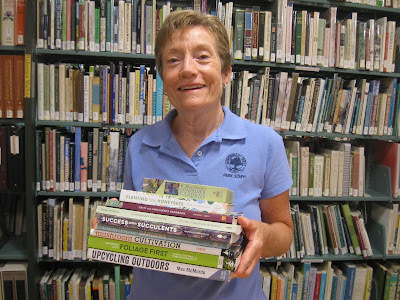 On Saturday August 4, Washington Gardener Magazine donated a stack of gardening books to the library at Brookside Gardens. The value of the books came to $212, making the total amount donated to Brookside Gardens thus far from the magazine around $6,500! Book topics in this batch ranged from garden decorating to succulent growing to planting for pollinators. Washington Gardener Magazine looks forward to donating even more gardening references to the community at Brookside Gardens in the near future. 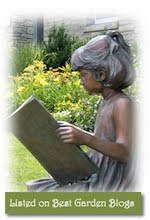 The mission of the Horticultural Reference Library at Brookside Gardens is to be a resource for Brookside Gardens and Montgomery County Parks staff, the citizens of Montgomery County, MD, and any other individual interested in learning about the science and art of Horticulture. 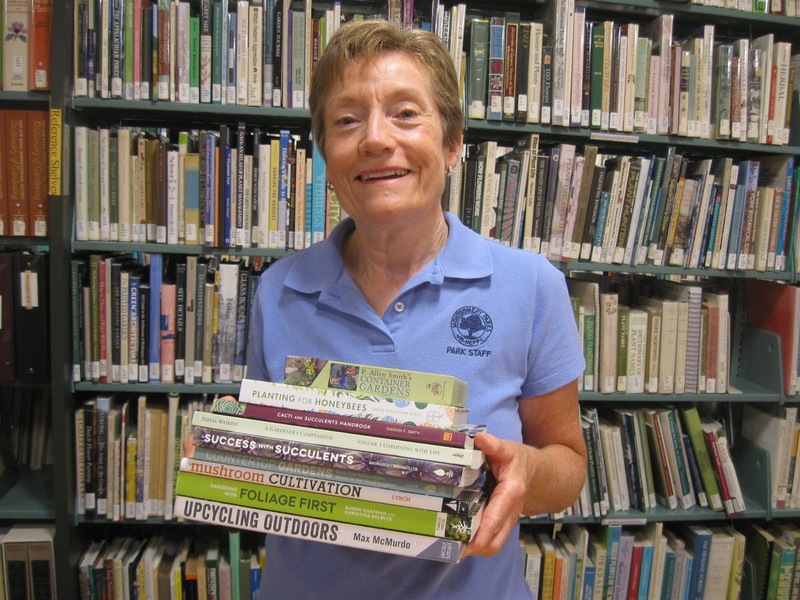 Volunteer librarians are there and ready to help you find answers to your plant questions; they are available Monday through Friday at 10 a.m. to 3 p.m., or by appointment. 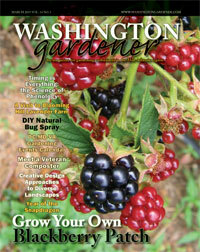 Washington Gardener Magazine dedicated to treading lightly on this planet. Because we are committed to doing all we can to protect and preserve the environment, we've adopted business practices to make our footprint as small as possible. We source 100% wind power. All of our partners and suppliers are local (DC-area) businesses and we support our local public gardens. Racquel Royer is a senior studying broadcast journalism in the Philip Merrill College of Journalism at the University of Maryland, College Park. This summer, she is an editorial intern at Washington Gardener. Another 5+ inches of rain this week. Again, I am NOT complaining - just reporting. Anything that saves me from having to water daily in the oppressive summer heat is a blessing. This weekend looks to be a break in the rains and maybe after a few days of drying things out I can finally get back to planting, weeding, and general clean-up. The wood chip paths have long slid downhill to neighboring plots and the weeds are growing like crazy. A pretty strawflower plant has popped up (pictured at left). I have never plated any of that kind. It is a nice surprise and a sweet substitute for all my zinnias that the damn rabbits keep eating. 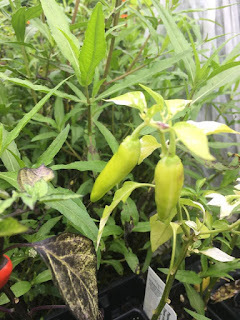 The 'Fish' Peppers and other hot peppers are still in their original 2" pots! I would feel guilty but they are all seemingly doing well. I think it is because they are still in the pots and are sitting in a tray off the ground, which is giving them some nice drainage whereas if they were planted in the soil, they would like have rotted by now. Last weekend, we visited Tusculum Farm in Laytonsville, MD, on the Montgomery County Farm and Harvest Tour. 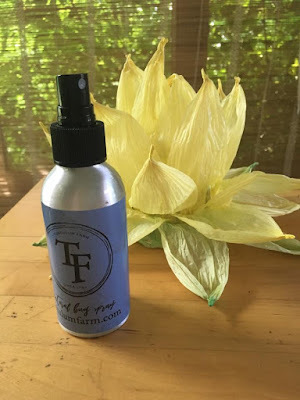 The activities included working with essential oils, including making your own "natural" bug spray to ward off ticks and mosquitos. Here is the easy recipe. Add the water and witch hazel to the container, then slowly add in the essential oil drops so you don't spill or lose count. Screw on the container cap. Make a label and apply it to the container. Shake it up. Spray on ankles and rub in. The verdict is still out on whether the spray is truly effective or not, but it smells good to us!